Cruise passengers are paying more in gratuities, as almost all big cruise lines seek to retain and attract good service personnel and remain competitive with each other. Five lines have raised or announced increases so far this year, with one, Norwegian Cruise Line, raising its gratuities twice. Princess Cruises was the latest to jump on the bandwagon, saying last week that it would raise gratuities 12.6% starting Jan. 1. The moves raise the overall cost of a cruise without raising the fares on which travel agents earn commission. But several agents said clients are not noticing or pushing back against higher gratuities and that agents don’t go out of their way to discuss them, other than to say they are automatically billed at the end of a cruise. “Most of the people, when they are initially booking a cruise, they know they have to pay gratuities,” said Shari Marsh, owner of Cruise Holidays Land and Sea in Raleigh, N.C.
That kind of accepting attitude on the part of many passengers has opened the door to increases that were harder to pass along during the economic swoon that lasted for several years beginning in 2008. Princess, which as late as 2007 was at $10 a day, raised the figure by 50 cents in 2008 and then waited until May 2011 to increase it to $11.50. Beginning with cruises departing Jan. 1, the suggested gratuity will jump to $12.95 a day, with suite guests paying $13.95. Brian O’Connor, vice president for public relations, said Princess is simply catching up with the field. “We were not in line with our competition, so these increases bring us in line with other premium brands,” O’Connor said. While most lines’ gratuities are now at $12.95, Carnival Cruise Line’s are at $12 after raising its rate to that level a year ago. At the high end of the scale, Norwegian Cruise Line’s suggested gratuity charge is $13.50, having raised it in March from $12 to $12.95 and then again, in August, to the current rate. At a press luncheon several weeks ago in Papenburg, Germany, where Norwegian is completing construction of its next ship, Norwegian President Andy Stuart declined to go into detail about the line’s rationale for higher gratuities, saying merely that management feels they are now at an appropriate level. Frank Del Rio, chairman of Norwegian’s parent company, Norwegian Cruise Line Holdings, has made it known that he considers better service one of the keys to improving customer retention at Norwegian. It isn’t clear exactly how much of crew compensation is derived from tips, since most cruise lines closely guard that information. But O’Connor said that gratuities represent an “important” part of crew compensation. Estimates of the share of crew salary that tips constitute vary from around 50% to nearly all of it in some positions. Cabin stewards earn from $1,400 to $2,400 a month in wages alone, according to Cruiseshipjob.net, a recruitment site. 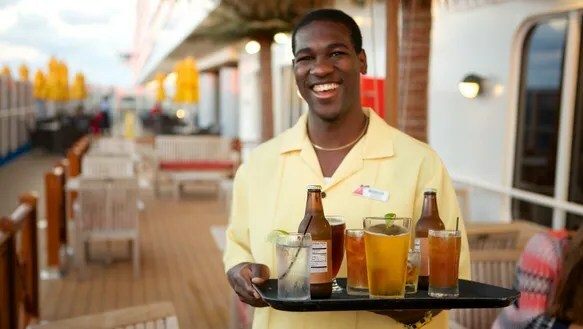 Waiters earn between $2,500 and $4,000 a month in combined wages and tips, according to another site, Cruiselinesjobs.com. Throughout the economy, the level of tips in general has been rising, although not at the same rate as gratuities at sea. “Tips increase over time,” said William Michael Lynn, a professor at the school of hotel management at Cornell University, who said that the average tip at a U.S. restaurant is now approaching 20%. The most recent Zagat Dining Trends Survey found the average meal tip in the U.S. was 19.3%. That compares with an average of 18.6% in 2004. Historically, cruise lines have provided breakdowns of where tips go, and some still do. On its website, Carnival says of its $12 total gratuities that $6.10 is allocated to dining staff, $3.90 to stateroom attendants and $2 to kitchen, entertainment, guest services and other hotel staff members. Increasingly, however, gratuities are being treated as lump-sum service charges added to the bill at the end of the cruise. Guests remain free to adjust the amounts, although Norwegian recently said charges can only be altered after guests depart the ship, not onboard. “A lot of people will not take the time and be disciplined enough to go through that process,” said Adrienne Greben, a CruiseOne agent in Concord, Ohio, near Cleveland. Other lines continue to ask that adjustments be made at the guest services office, with some saying amounts are final if undisputed by the time of disembarkation. Agents say cruise lines have made raising gratuities more palatable with some loopholes. Increasingly, cruise lines are also offering promotions in which free gratuities are one among a choice of three or four options. Greben said clients seldom pick the free-gratuity option, however. But most lines also allow onboard credits to be applied to gratuities, and many do that, Greben said. Guests can also apply onboard credits they get from shareholder perquisites, from credit card offers or by booking their next cruise while on the current voyage. Some travel agents said they were also resigned to the fact that rising gratuities don’t add up to rising commissions. Among them is Amy Fields, owner of Amy’s Total Travel in Towanda, Pa.
Holland America Line has launched a campaign to promote itself as Seattle’s hometown cruise line. It’s a smart move that dovetails with an increasing emphasis on local as well as national marketing of cruise brands. HAL won’t be advertising itself that way in Omaha or San Antonio, said President Orlando Ashford. But the greater Seattle area, with 3.6 million residents, is a top metro market with the income to cruise and HAL’s ships conveniently departing all summer from its piers. Ashford said HAL, which has been located in Seattle for 32 years, wants to raise its profile as a corporate citizen in an area that includes names such as Microsoft, Nordstrom, Starbucks and Amazon.com. Save for perhaps Princess Cruises in Los Angeles, it’s hard to think of another cruise line with such a strong position as a hometown cruise line. Miami is a bit of an open city, with Carnival Cruise Line, Norwegian Cruise Line and Royal Caribbean International all having a longstanding claim. But Norwegian made a play for New York and Miami with the introduction of its last two ships, the Norwegian Breakaway and Getaway, which were themed to those two cities. And Carnival is making a big push to be considered the local favorite in the Texas market, where it is the official cruise line of the Dallas Cowboys, and in New Orleans where it recently struck a similar deal with the New Orleans Saints. Who knows, maybe there’s a deal in the works to make HAL the official cruise line of the Seattle Seahawks, whose blue 12th man banner is ubiquitous in the Seattle-Tacoma area. It might look good draped on HAL’s new downtown headquarters, which is expected to open at the end of next year. Norwegian Cruise Line took delivery of the 4,270-passenger Norwegian Escape Thursday. The 164,600-gross-ton ship, which was constructed by the Meyer Werft yard in Bremerhaven, Germany, will make its way to Miami via stops in Hamburg, Germany, and Southampton, England. It is scheduled to arrive in Miami on Oct. 29 and will be christened by Miami-based musician Pitbull on Nov. 9. The Escape is the first in the Breakaway Plus class and, as its name suggests, is a slightly larger version of the Norwegian Breakaway and Getaway now in operation. Among its features is a larger VIP-only Haven area, expanded ropes course, a Jimmy Buffet’s Margaritaville, the Food Republic dining hall overseen by the Pubbelly Restaurant Group and the Bayamo restaurant by chef Jose Garces. Per Norwegian tradition, its hull carries a distinctive, colorful design; in this case, it was designed by Guy Harvey.